The Guardian of Time is a sea dweller of completely unknown origin and purpose. As far as the Nauticans are concerned he is timeless and has always dwelt in the deep. The Guardian of time cannot be killed, when defeated in combat his spirit leaves the battlefield and returns to an earlier time to weave future events to his liking. These chains have been the death of countless enemies, the Guardian uses them in close combat to lash and throttle his enemies. Lash - the Guardian can stand and shoot using the chains, range 8 inches, causes d6 str 6 hits. Throttle - the Guardian can forego his usual attacks and attempt to wrap the chains like a noose around a single enemy model (of any size !) in base to base contact. The Guardian makes his throttle atempt before combat begins but after impact hits. If the Guardian passes an initiative test and the enemy fails their initiative test then the enemy is trapped in a chain noose and immediately suffers d3 str 6 automatic hits. At the beginning of each subsequent combat phase the entrapped model must pass a strength test to break free (a roll of 6 is a failed str test) or suffer a d3 str 6 automatic hits. The entrapped enemy cannot attack the Guardian of Time until it breaks free. An enemy that breaks free can attack in that combat phase and can be attacked normally by the Guardian. This is not a weapon or armour but a unique gigantic immovable relic in the shape of a ship's anchor that materialises anywhere within the Nautican's deployment zone and within 6 inches of the Guardian at the beginning of each battle. The Anchor is of unfathomable weight and a gravitational protection surrounds all units within 6 inches. The units cannot be targetted by war machine weaponry as the rocks, cannon balls, bolts and lead shot is pulled towards the anchor and absorded into it's mass. Other ranged weaponry targeted at units within 6 inches of the anchor are at -1 to hit, as though the units were within soft cover. The Anchor is utterly indestructable and immovable, it will however instantly disappear for the remainder of the battle if the Guardian of Time is destroyed or moves more than 12" away from it. The Guardian is Stubborn whist within 12" of the Anchor (which remains stationary throughout the battle). 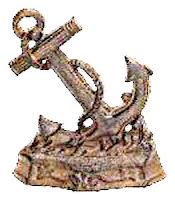 The Anchor's pure size and weight absorbs the residual magical energies on the battlefield like a giant whirlpool. A Nautican army including the Guardian of Time gains 1 extra power dice and 1 extra dispel dice (while the Guardian remains alive and within 12" of the Anchor). The power dice can only be used by a friendly spellcaster within 12 inches of the Anchor. The Guardian may never join a unit or be the army's general, he has his own mysterious agenda.